Head high, eyes forward, and please, please keep your hands out of your pockets. In a study published in 1992, researchers Nalini Ambady and Robert Rosenthal at Harvard University tested the power of first impressions by examining students’ perceptions of their professors. For the experiment, Ambady and Rosenthal showed muted, 10-second video clips of professors teaching to participating undergrads, who rated the teachers on 15 dimensions of effectiveness, including warmth, optimism and professionalism, all based entirely on nonverbal cues. Ambady and Rosenthal looked at the results and wondered if they could change the ratings by shortening the clips. So they cut them from 10 seconds to five seconds. The ratings didn’t change. They cut them to two seconds. Nothing changed. They concluded that we make a snap judgment in the first two seconds of meeting someone, and we rarely adjust it -- even when we get more information. We decide if we like and trust someone before we have even heard him or her speak. But here’s the most interesting part: Ambady and Rosenthal took the ratings from each of these clips and compared them with the actual student evaluations of these same teachers after an entire semester of classes. Again, they were surprisingly similar. Teachers who got poor rankings from the two-second clips also got low ratings from students who took their classes. Those teachers agonized over their curriculum and teaching methods, and even spent time bonding with students. But in the end, it didn’t matter. The students decided how effective teachers were within seconds. Behold the power of a first impression. Intimidated? Don’t be. My research suggests entrepreneurs can easily hack those first few seconds and make a great and lasting impression. It just comes down to four skills. 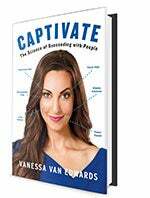 Adapted from CAPTIVATE: The Science of Succeeding with People (Portfolio), by Entrepreneur columnist Vanessa Van Edwards, out now.